Roxy’s Best Of… Bay Head, New Jersey » Blog Archive » The Mermaid Swim Team Takes A Vacation from Our Bay Head Beach House…Wendy McCarthy’s Mermoments Show at the Anchor & Palette Opens Friday Night, July 25th! Almost two months ago, Rex and I wandered into the Anchor & Palette Gallery on Mount Street in Bay Head, NJ, and walked out with the Mermaid Swim Team by local Wall, NJ, artist Wendy McCarthy. Since then, Maddie and London have been waking up on weekends with a smile to greet the lovely Mermaid Swim Team in their “Rainbow Room” in our Bay Head beach house. But starting this past Sunday, our Mermaid Swim Team has been on vacation! 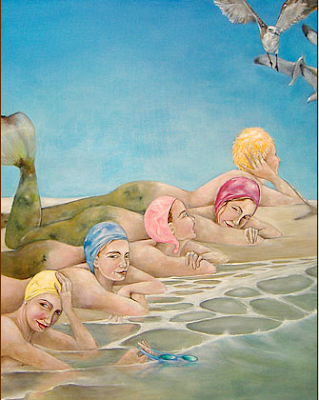 The Mermaid Swim team is part of the Mermoments trilogy that Wendy McCarthy created for her show at the Anchor & Palette gallery. Mermoments opens with a reception at the Anchor & Palette this Friday night, July 25th, and runs through August 4th on Mount Street in Bay Head, NJ. We met artist Wendy McCarthy, who happened to be at the Anchor & Palette on the day we discovered the Mermaid Swim Team…she was so pleased to be there when the first of her beautiful Mermoments paintings was sold. Wendy put a lot of love into the painting, but she could see we would give it a good home. Rex, London, Maddie & I will be at the opening reception on Friday night…hope to see you there!